Starting a blog is the first introduction into making money online for many. However, people believe that making money from a blog is hard, yet that couldn't be further from the truth. Most blogging information on the web will provide you with outdated information that might be fun but not very profitable. When I first started blogging, I tried all of these tactics, and soon learned that they were horrible for actually making a profit. At that point, I sought out the best information I could find and paid thousands of dollars studying what makes blogs successful and what doesn't. After years of studying, I started implementing my own strategies and, before I knew it, I had an amazingly profitable blog. 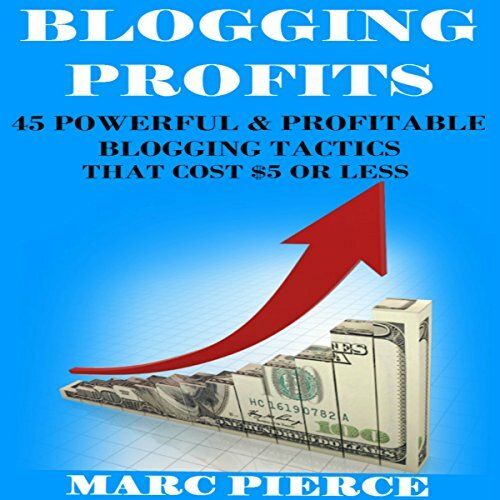 I have been making money from various blogs ever since and will show you 45 proven tactics that will make your blog profitable that will only cost you $5 or less. This book will prove to you that blogging can be more than just a passion project. Allow me to be your guide and show you how to make money from the comfort of your own home. Would you try another book from Marc Pierce and/or Mike Norgaard? Annoyance and disappointment. Although the content did include the information mentioned in the description, the last 15+ minutes were a "free gift" of a sample of a different book from the author (translation = a 15 minute advertisement for buying an additional book). This might not be such a big deal, expect that the total recording is barely over an hour! Given how short the overall recording is, it didn't feel like a "free gift" as much as having been tricked into also buying a 15 minute "infomercial" to spend more money on his next book. It was actually pretty good information on the topic I thought I would be learning about, so if it has been accurately described in the audible description it might have felt less like a rip-off. Unfortunate. good book with a lot of great information, but this does not work as an audio book. I'll be picking up a physical copy of the book, but I will not recommend this audio version for anybody.